Good morning and happy Tuesday everyone! I do hope it's not so dreary where you are today... I'm hoping there's a wee bit of sunshine in your life today!? 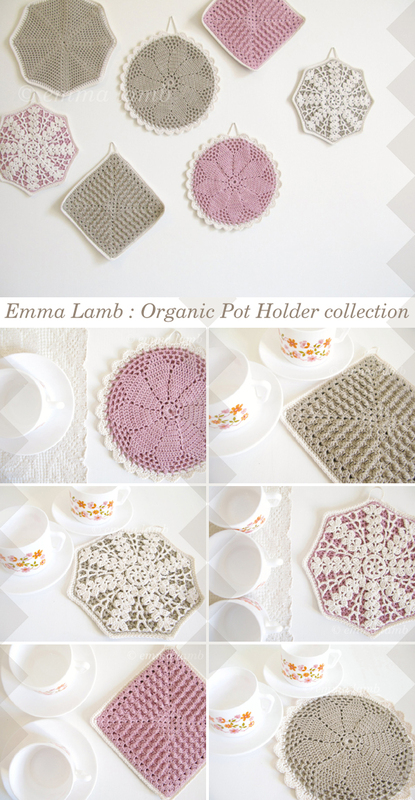 This week I'm adding a freshly crocheted batch of organic pot holders to my shops. They will be the last batch in this incarnation (these colours with these design in this beautiful organic yarn) and will never be repeated in quite the same way. Although I'll definitely be working up some of these designs for my regular pot holder collection I'm planning to take a new direction with my organic/up-cycled ideas. Those are on the hooks as we speak and I'm hoping to have them ready in a week or two. In the meantime keep a wee eye on these lovelies popping up on my shop shelves over the coming days. I'll post the updates to my Facebook page as they happen. Remember I won't be making these again so if you'd like one for yourself or a Christmas gift, grab them while you can! *Just a wee reminder that Folksy no longer requires you to set up an account to purchase items. It's holiday shopping made easy... yay! These are beautiful Emma. We have recently discovered you and love your work! Those are beautiful! The colors are perfect! I was thinking of making my own pot holders for our next house. I can't wait! I have to say it in italian: "meravigliose"
This is a wonderful composition! Take the vinantesa to greet you and tell you I admire your blog. It is always a joy and an explosion of color! Congratulations, Emma!